Founder of the St. Alban's Place Synagogue, London; born in the last quarter of the eighteenth century; died Dec. 31, 1840. He was appointed head of the Denmark Court Congregation in 1824, and took a prominent part in founding the new place of worship at St. Alban's place, St. James's (known both as the Western and as the Westminster Synagogue), which was consecrated Sept. 7, 1826. 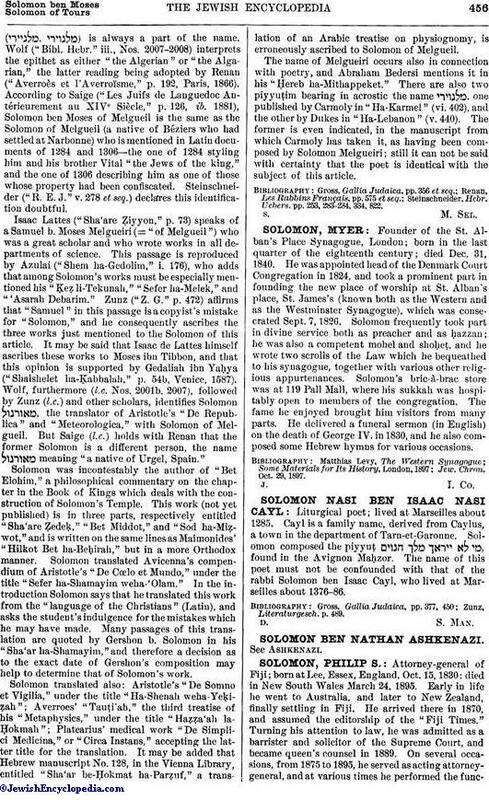 Solomon frequently took part in divine service both as preacher and as ḥazzan; he was also a competent mohel and shoḥet, and he wrote two scrolls of the Law which he bequeathed to his synagogue, together with various other religious appurtenances. Solomon's bric-à-brac store was at 119 Pall Mall, where his sukkah was hospitably open to members of the congregation. The fame he enjoyed brought him visitors from many parts. He delivered a funeral sermon (in English) on the death of George IV. in 1830, and he also composed some Hebrew hymns for various occasions. Jew. Chron. Oct. 29, 1897.